Tokyo is the city of two halves: on one side you have the ultra modern, massive skyscrapers and neon lit signs, on the other you have the traditional neighbourhoods with beautiful gardens, temples and shrines. Don’t be fooled by its seeming quaintness - Japan has the third largest economy in the world, larger than UK and Germany combined. It is the high-tech power house of Asia, and it’s where you want to be doing business. If you’re airfreighting your exhibition stand from the United States to Tokyo, it will take five to 10 days, including customs clearance. Ocean shipments can take between three and seven weeks. Tokyo can be explored by foot and by public transport, such as buses and trains. Taxis are also available, and although not cheap, are professional and honest. Anything that might have soil attached. Items made from endangered species. Uncensored adult media, including video, magazines and comic books. Park Hyatt Tokyo - instantly recognisable after Bill Murray and Scarlett Johansson met there in Lost in Translation. 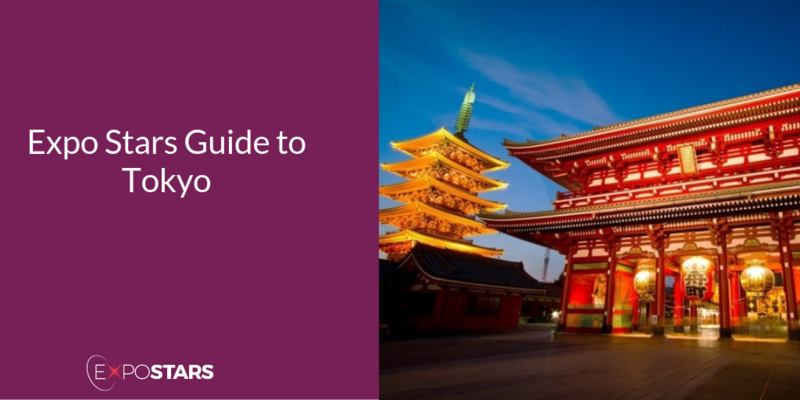 Visit Tokyo’s oldest Buddhist temple, Senso-Ji, which was built for Kannon, the goddess of mercy. Get up early and witness the world’s biggest wholesale fish and seafood market in action, at Tsukiji fish market. If you’re there between 2-3am you might even be lucky enough to watch the tuna auction. Kyourakutei - indulge in some Michelin-starred, freshly handmade soba noodles with vegetable and seafood tempura. T’s TanTan - tucked away in Tokyo station this is a popular spot to grab some tasty vegan ramen. Standing Sushi Bars - eat standing up, order your sushi from the chefs behind the counter and keep going until you’re full. The currency in Tokyo is the Japanese yen. Visa requirements: You must have a valid passport and an onward/return ticket for tourist/business "visa free" stays of up to 90 days. Japan does not have a tipping culture and tips aren’t expected. In fact, they will most likely be refused. Punctuality is very important. Arriving five minutes early is considered cutting it close. Avoid pulling a business card from a back pocket, or placing a card you have received in your back pocket, it is seen as disrespectful.